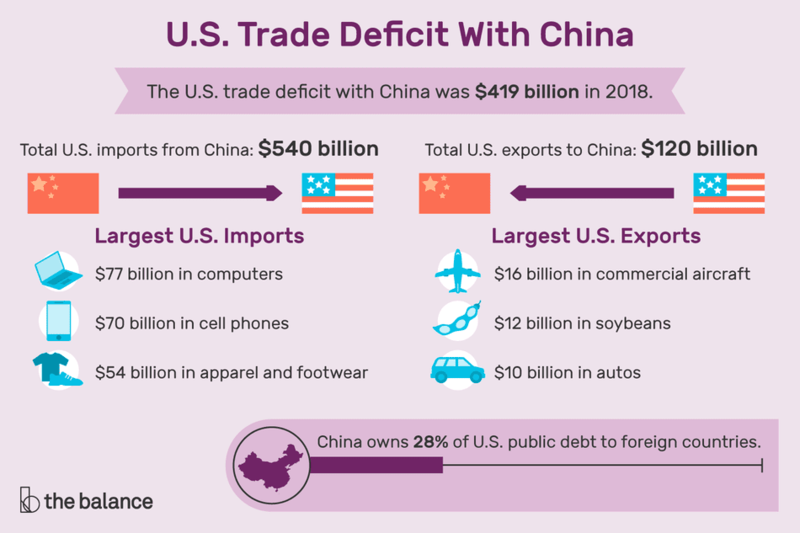 The U.S. trade deficit with China was $419 billion in 2018. The trade deficit exists because U.S. exports to China were only $120 billion while imports from China were $540 billion. The biggest categories of U.S. imports from China were computers and accessories, cell phones, and apparel and footwear. A lot of these imports are from U.S. manufacturers that send raw materials to China for low-cost assembly. Once shipped back to the United States, they are considered imports. China's biggest imports from America are commercial aircraft, soybeans, and autos. In 2018, China canceled its soybean imports after President Trump started a trade war. He imposed tariffs on Chinese steel exports and other goods. From January 2018 to July 2018, the United States exported a total of $74.3 billion in goods to China. During that same timeframe, the U.S. imported $296.8 billion, according to the U.S. Census Bureau. As a result, the total trade deficit with China is $222.6 billion. A monthly breakdown is in the chart. A lower standard of living, which allows companies in China to pay lower wages to workers. An exchange rate that is partially fixed to the dollar. If the United States implemented trade protectionism, U.S. consumers would have to pay high prices for their "Made in America" goods. It’s unlikely that the trade deficit will change. Most people would rather pay as little as possible for computers, electronics, and clothing, even if it means other Americans lose their jobs. China is the world's largest economy. It also has the world's biggest population. It must divide its production among almost 1.4 billion residents. A common way to measure the standard of living is gross domestic product per capita. In 2017, China’s GDP per capita was $16,600. China's leaders are desperately trying to get the economy to grow faster to raise the country’s living standards. They remember Mao's Cultural Revolution all too well. They know that the Chinese people won't accept a lower standard of living forever. China sets the value of its currency, the yuan, to equal the value of a basket of currencies that includes the dollar. In other words, China pegs its currency to the dollar using a modified fixed exchange rate. When the dollar loses value, China buys dollars through U.S. Treasurys to support it. In 2016, China began relaxing its peg. It wants market forces to have a greater impact on the yuan's value. As a result, the dollar to yuan conversion has been more volatile since then. China's influence on the dollar remains substantial. China must buy so many U.S. Treasury notes that it is the largest lender to the U.S. government. Japan is the second largest. As of December 2018, the U.S. debt to China was $1.12 trillion. That's 28% of the total public debt owned by foreign countries. Many are concerned that this gives China political leverage over U.S. fiscal policy. They worry about what would happen if China started selling its Treasury holdings. It would also be disastrous if China merely cut back on its Treasury purchases. Why are they so worried? By buying Treasurys, China helped keep U.S. interest rates low. If China were to stop buying Treasurys, interest rates would rise. That could throw the United States into a recession. But this wouldn’t be in China's best interests, as U.S. shoppers would buy fewer Chinese exports. In fact, China is buying almost as many Treasurys as ever. U.S. companies that can't compete with cheap Chinese goods must either lower their costs or go out of business. Many businesses reduce their costs by outsourcing jobs to China or India. Outsourcing adds to U.S. unemployment. Other industries have just dried up. U.S. manufacturing, as measured by the number of jobs, declined 34% between 1998 and 2010. As these industries declined, so has U.S. competitiveness in the global marketplace. President Trump promised to lower the trade deficit with China. On March 1, 2018, he announced he would impose a 25% tariff on steel imports and a 10% tariff on aluminum. On July 6, 2018, Trump's tariffs went into effect for $34 billion of Chinese imports. China canceled all import contracts for soybeans. Trump's tariffs have raised the costs of imported steel, most of which is from China. Trump's move comes a month after he imposed tariffs and quotas on imported solar panels and washing machines. China has become a global leader in solar panel production. The tariffs depressed the stock market when they were announced. The Trump administration is developing further anti-China protectionist measures, including more tariffs. It wants China to remove requirements that U.S. companies transfer technology to Chinese firms. China requires companies to do this to gain access to its market. Trump also asked China to do more to raise its currency. He claims that China artificially undervalues the yuan by 15% to 40%. That was true in 2000. But former Treasury Secretary Hank Paulson initiated the U.S.-China Strategic Economic Dialogue in 2006. He convinced the People's Bank of China to strengthen the yuan's value against the dollar. It increased by 2% to 3% annually between 2000 and 2013. Former U.S. Treasury Secretary Jack Lew continued the dialogue during the Obama administration. The Trump administration continued the talks until they stalled in July 2017. The dollar strengthened 25% between 2013 and 2015. It took the Chinese yuan up with it. China had to lower costs even more to compete with Southeast Asian companies. The PBOC tried unpegging the yuan from the dollar in 2015. The yuan immediately plummeted. That indicated that the yuan was overvalued. If the yuan were undervalued, as Trump claims, it would have risen instead. Does China Manipulate Its Currency? How Does the Yen Carry Trade Affect You? It's Good That China's Growth Is Slowing. Really.